It looks like it's going to be one of those summers, where we have a lot of dark, gray days. Oh, please spare me. Thursdays are usually the day that Anchorage Golf Course has both ladies' days play and seniors golf lessons. No inspiration to spend big bucks for a gloomy day . . . . short blog! So, it appeared to be an ordinary day . . . a picnic luncheon at the church, a meeting with the magicians, few piano lessons, and cap it off with a visit to the bank, and the Petroleum Club. But it was not to be. As I was reaching for the door to enter my bank, one of the girl's was locking it and said, We have an emergency. This was a bit suspicious, and I thought, oh, a robbery. So I went across the hall and had a coke, then had a long talk about the Alaska gas line with a knowledgeable fellow (well-known radio announcer) and learned a lot about how I should be thinking. This has been the biggest political issue that Alaska has had to face, and it is still not resolved, as the new governor threw out a more sensible proposal of the former governor. Meanwhile, across the hall, police cars arrived, and some policemen entered the club to look at the surveillence video from the common hall at the entrance. In order to keep to my stress-free life, I left, and came home to finish daily to-do list. Done! No sunshine, but it didn't rain on the golf course today. The wind seems blow a lot these days, whereas it never used to. But it was a delightful morning at Moose Run, and when we were teeing off on #8, we saw a bear in the path. I was pretty uncomfortable about him (?) watching us, but he seemed disinterested and ran back into the woods. I used to have a picture of a moose tramping across the green, and our bags are sitting on the edge of the green, but we had moved back. There are still moose out there, but they come into downtown too, now which they never did in the old days. It's always a pleasure to visit the cemetery, and view the beautiful memorials. The Pioneers of Alaska have a tradition of cleaning up the park on the day before the announced Memorial Day, and have a ceremony on the day itself. The President of the Women's Igloo tripped on one of the tombstones, and ended up in the hospital,so a substitute trustee acted as the m.c. The Color Guard from the US Army provided the needed pageantry, and the names of the sisters (and brothers) we have lost over the year were read by the respective historians. The was followed by a potluck at Pioneer Hall. That was a nice luncheon, but not very well attended. I guess a lot of people just left town for the long weekend. This weekend marks the official start of summer season. A long time tradition in Anchorage has been The Salmon Parade which is a downtown walking tour display of decorated Salmon! It's always quite creative and the charity auction in September always brings a generous donation for non-profits. The other personal joy for me is that the golf courses move from the temporary greens to the real grass greens. Soon to follow will be our baseball season, which unfortunately lasts only 6 weeks, but the Anchorage Bucs are ready to go. The fishing charts are already being posted in the paper, and noting the price per fish in the stores, it will be an incentive to cast that line yourself. Ship Creek, which flows thru downtown Anchorage, is stocked and you can enter the derby there. I prefer to sit in the Bridge Restaurant which spans the creek, and watch them pulling the big Dolly Varden and Silvers out. So much for the run-down on Anchorage on this quiet Sunday afternoon. Today, I experienced another 'first' . . . I walked into the Post Office and there was no line. The agents almost seemed happy to have some business. I mailed my package and bought stamps in minutes. I'm going to try some 'Forever' stamps, altho' I couldn't resist a sheet of Star Wars stamps, too. Speaking of stamps, I understand it's a long process to have a stamp dedicated to your cause. I'm a state officer of Hostelling International, and 'we' are lobbying in Washington D.C. to have a stamp made in 2009 to honor 100 years of hostelling. I don't quite understand the process, even tho' my friend is a governor on the USPS Board (Commission?) ... we talk about other things when we socialize, but I have a lot to learn. I also read recently that soon we'll be able to print up a stamp with our own image on it. You used to have to be dead -- but then you couldn't print it. Okay, just an attempt at levity. Memorial Day weekend is progressing with a lot going on locally in Anchorage, to keep us off the roads. . . that is, if the price of a gallon of gas doesn't. The tourist season is upon us It didn't take long for the downtown streets to fill up with hordes of eager tourists who want to see it all. The weather has not been cooperating so far, but we usually have a lovely June. A few years ago, we had very few hotels, but no longer. Many homes have become B&B's and hotels and hostels have sprung up on every corner flanked by so many restaurants. Last night was the opening of the only Hostelling International member, called Backpackers Inn. I hope that won't turn the older visitors away, because hostels are open for all ages, and it's a convenient and inexpensive place to stay. I'd guess at least half the guests are Europeans, as it's a way of life over there for students, etc. This is the Memorial Day weekend, but not by the calendar. There's a lot planned locally, to avoid paying the price of gas needed for a long-drive out of town. Enjoy! Last night, the Petroleum Club hosted a meet-and-greet for our (Anchorage's) football team, called WILD, and they truly are a wild bunch. They appeared for the party and dining at the club around 5:30 p.m. and hastened to the buffet line. Food and drink were complimentary, thanks to our host/corporate sponsors. Only a few of the team are from Anchorage, and they are still in the process of getting it together, but if weight has anything to do with it, they will be winners. Several Samoans are on the team, and they are BIG guys. We also circulated and talked to a few of them. The new coach is Hans Deemer, who originally comes from Palmer Area. For those who don't know, that's a town NE of Anchorage about 40 miles. After the party, the club regularly has a wine-tasting. This consists of sampling and rating four 2-oz. glasses of wine. I especially like to see how our wine Steward can carry 16 wine glasses in one hand. Guess that's why we sent him to wine school. If you know Anchorage, you'll be familiar with Campbell Creek, which winds around town kind of east to west. So, at Seward Highway is a popular spot called the Peanut Farm. I think it's the owners, or someone else, that built a rather fancy theatre, with stadium seating and stage with curtain, just a few hundred yards east of this. Most locals don't even realize it's there, as I found out last night when I attended the Evening Exchange, which members of ACVB sponsor monthly. They had a lovely buffet, and drinks were included, which they allowed you to carry inside the theatre. After introductions, the opening act was Hobo Jim, and there is no better performer anywhere. He's a local character with world recognition for the songs he's written, and his small talk adds color to this performance, which he does on a regular basis for several hours non-stop. I'm definitely one of his following, and was sorry they cut him off last night for one-minute commercials of all the members. Anyhow, it was a lot of fun, and a great way to spend a beautiful summer evening in Anchorage. The skies looked rather dim this morning, but it was ladies day at Moose Run Golf Course, so I drove out -- it's about 10 miles, which is the farthest I ever drive from my condo, and sometimes the weather is different there. Let's say the rain did hold off, and we got a round of golf in. They still have temporary greens, as the winter was pretty hard on them, but the fairways weren't in too bad a shape. It felt great tho' and none of us went into the woods at all! Gee, I haven't done any complaining on today's blog, but I'll bet I could think of something if I tried. No time now, because a piano student's coming and I'll need to post this first. Seems like that's a song ... well, we have both in Anchorage today, and my daily gripe is one that has to be narrowed down from several that just seemed to pop up out of no where . . . but no matter, because remember, I lead a stress free life. So I'm not going to let it bother me that a member of my board decided to invest money into renting a room to give a seminar/workshop for Hostelling International. Somehow, he forgot to publicize it, so it's definitely going to be minimal. I'm going to consider it as a way of trying out our new projector, which I hook into my laptop computer, and show a powerpoint demonstrated by national. Isn't that just ducky, tho'. Then I think it'll be time for a mint julep on one patios. All the restaurants in Anchorage have opened their patios for the summer, and the flowers are all blooming. Lovely place to be. Today's church's are different from the past. The old traditional churches have been forced - is that too strong a word - to have a contemporary service on Sunday mornings, and my older, traditional church is no different. But since I have been writing my gripes daily (I have to get on a new track when I lose material, if I ever do) I am adding one today that's been buggin me for some time now. This group of 5 or 6 teenagers leaves their gardening (I say that because they still have their gardening clothing on) to lead the singing of Christian songs each Sunday. Now I know that's a hard task, and they do get thirsty, but drinks re not allowed in the sanctuary at our church and posting reflect this rule. They obviously ignore these signs, or perhaps they don't know how to read, but I feel that the usher's should top them, and anyone else who comes into the sanctuary with a bottle or styrofoam cup of something/anything. Well, that started me off. . . another thing that really bugs me is this graduating senior gal, who has a practice weekly of snatching the music stand the pastor uses for his notes DURING HIS CLOSING PRAYER. Then she sets it up with the other 3 or 4 song leaders and continues with the closing song. Well, there's lots more I could gripe about, but I'm going to try to be more pleasant tomorrow. My blog seems to contain nothing but gripes. Not today. I'm just happy to continue my stress-free life, and happy to have a place to help in this. There's nothing wrong with today, so far, so I thought I'd report on some recent funerals and wakes I've attended. 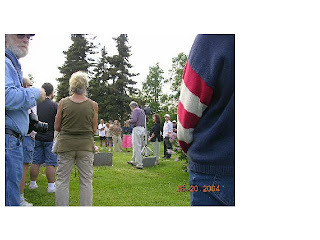 Yesterday, I attended the wake of a local fellow, who some referred to as the last of the Anchorage Mafia. The venue was Kinkaid Park Chalet. If you're not in Anchorage, you wouldn't have heard of this place, but it is the original site of the Kinkaid homestead, and a choice piece of property it is. The Anchorage International Airport borders on the north, the suburban area of Sand Lake to the east and south, and beautiful Cook Inlet to the West. It was a beautiful evening, and when the sun sets over Mt. Susitna, on a clear evening, there is no more beautiful sight. There was no formal service, just a lot of older locals you don't see around much anymore. But the daughter of the departed was a beautiful animated gal, who was in Thailand getting a body job, when this fellow was called. She told a detailed story of her visit with Budda which happened by coincidence, or karma? at the same moment. She really needs to 'blog'. Last week, I attended another service, not quite so joyous. The fellow died on his 43rd birthday, and the cause was never revealed. He came from a wonderful family, and had one older brother. His passing came as a surprise to me, altho' I didn't really know him, just his parents. There is no sadder loss than to lose your child. It's 'natural' for a spouse, or parents, to die first, but not your own son. There were several touching comments from the attendees, and I love a good cry. It was hard to explain why my eyes were all red when I went to the other end of the hall for the ladies golf luncheon. The red eyes there were caused there by the early opening of the bar. Not me, really. Well, it's a beautiful day in Anchorage, and there's a lot to do out there, so here I go! You probably haven't heard of the Pioneers of Alaska. Even many locals don't know about this group of older Alaskans, who have organized groups called Igloos in several major cities of Alaska. Of course, the largest group is in Anchorage. For those of you who have been reading my blogs, I have to complain about something so here goes. I've been a member for about 5 years now. One of the requirements of membership is that you have lived here for 30 years. When I was a new kid of the block, I suggested they have a webpage, since I design these. This was totally unheard of, and I was shot down. I kept my mouth shut, and didn't say any more about it, until recently, one of the older members, and a state officer (that's called the Grand Igloo) approached me, saying we do need this, especially as it would help market a wonderful book they self-published about five years ago, called Fond Memories of Alaska. I drew up a storyboard for a possible website, and she took it to the historic committee meeting. You can guess the answer. Then I suggested a local bookstore, not unlike Barnes and Nobles, only better. I went to talk with them, and they want to make the sales coincidence with an event. Of course, they are looking at a commission and discount. You already know the answer - this got nowhere. So now we have a thousand plus copies sitting in our storeroom, jealously guarded and never to be seen. It's just a shame, as they are great books. There are two volumes, each retailing for $30. I'm going to forget the whole thing, as I lead a stress-free life, remember? In the meantime, I listed my copy on Amazon.com, but I didn't tell them, as I'd surely be in bad favor if they knew. The summer season is approaching fast, but not too fast as far as I'm concerned. This means lots of hostellers will be coming to/thru Anchorage. Unfortunately, we no longer have any hostels that are members of the national organization, formerly referred to as America Youth Hostels. This used to be identified by young, athletic, vigorous travellers. It was an inexpensive place to spend the night, with stays limited to 3 nights, and housekeeping chores assigned to the hostellers. Things have changed considerably over the years. Today the name is changed to Hostelling International, and its used by all ages. More like a hotel, they have even expanded services to include travel opportunities. This is both good and bad. My feelings remain that they shouldn't lose the old spirit and feel of camaraderie. This has happened. The main priorities of national appear to be twofold: lobbying Washington to get a USPS stamp to commenorate the 100th anniversary of existence, and presenting programs like World Travel 101 to members and volunteers the hostels gather. I think these should be on the back burner, and we need to restore the hostels of old. If this were to happen, we would be increasing national members, instead of losing so many hostels in recent years. Of course, this is my blog so I can say all this without discussion from my board. By the way, I'm president of the Alaska Council of HI. Here I am signing onto my first posting, and google, or whoever, chose to rouse my anger. Some people out there don't know that Alaska is part of the union. When I got to 'state' the default entered "U.S. Virgin Islands" as the country, like we're a territory. Nope, we've been a state since 1957. 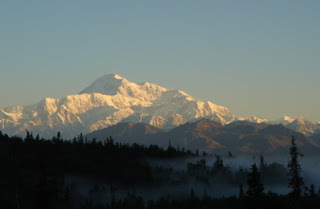 I'd been wanting to come to Alaska since the mid-forties, but it took a while. In 1966, the opportunity came, and so did I. By the way, the U.S. post office doesn't always know we're here either, as they think we're a foreign country. No way!